As you may have discerned from my many posts for fish dishes – I love seafood. I usually have fish about three times a week – at least. Every now and again though I crave a delicious bit of meat. One of my favorite preparations is grilled filet of beef with herb butter. I love this dish because it's so easy to make, it is elegant, and very flavorful. The herb butter is an accompaniment that enhances the flavor of the meat but does not over power it. I love to make this for a special romantic dinner pairing it with our favorite bottle of red wine. Knorr Aromat – a salty seasoning that also has the flavors of bouillon – sometimes available at regular grocery stores among the other Knorr products but you can also find this at most European gourmet specialty stores. 1) To prepare the steaks remove them from the refrigerator for a about 5-10 minutes before I'm going to cook them. 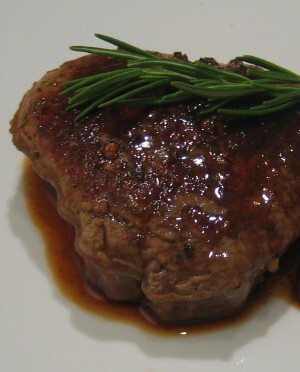 This allows them to lose their chill and will make for more tender and juicy steaks. Pat them dry with a paper towel and drizzle with a touch of olive oil on both sides and sprinkle with salt and pepper. Place on a hot grill pan and once placed on the pan do not touch or move the meat. This will create the lovely grill marks. Allow them to cook for about 5 minutes on the first side and 4 on the second side – this is for about medium to medium rare. If you're wondering how to tell when meat is done here is a method from the site by Adam at Men in Aprons that may help. 2) While the meat is cooking you can prepare the herb butter. Start with about a half stick of butter in a small bowl – it helps if the butter is at room temperature. Chop the rosemary, basil, and thyme (you can use any herb combo that you like although the herbs do need to be fresh – I highly recommend the rosemary too – it works so well with the meat) and add it to the bowl – about 1-2 tablespoons. Then add a pinch of salt and a few sprinkles of Knorr Aromat – if you do not have any Aromat then just use salt. Add 1 1/2 teaspoons of yellow mustard. Mix this all together so that it's evenly incorporated. Taste to make sure that the flavors are right – you may need to add more Knorr or salt depending on your tastes. Place a piece of wax paper or parchment paper on your counter and place the herb butter mixture on it – then roll it so that it forms a log. Place the herb butter in the refrigerator to allow it time to set and firm up again. When ready to serve just remove it from the parchment paper and place on a small serving dish. 3) Once the meat has cooked on both sides remove from the pan, cover with foil, and allow it to rest for at least 10 minutes – this allows the juices to redistribute so you get a juicy delicious piece of steak. Covering with foil will keep the meat warm. * The herb butter tastes delicious when eaten along with each forkful or you can add a little pat of the herb butter atop the meat and allow it to melt over it – both are great ways to enjoy it! I’m on my way. This is absolutely gorgeous, and you’re right, every now and then a beautiful piece of meat just hits the spot. How do you make ALL of your food look so good? I swear…I think you have have your choice of careers: TV food host OR food stylist! It’s also very cool to hear that you used a spice packet rather than buying six ingredients, using 1/8th of a teaspoon of each and letting the rest go bad. It’s so easy to overcomplicate cooking some times. Everything you make seems so approachable and easy. P.S. Loved your guacamole recipe!